I grew taters! Like, really really yummy ones! I’m a tater-maker, woo hoo!!! 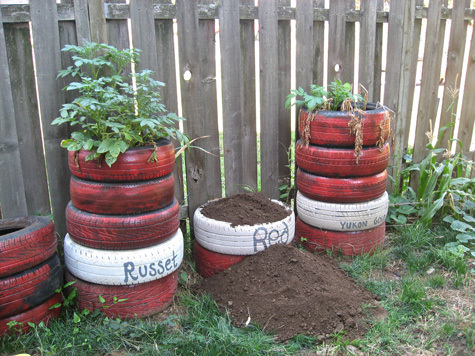 You may remember all the way back in April, I posted an article outlining how to grow potatoes in tire towers. I started my own tater seeds that month, and would periodically update every few months. Everything seemed to be going swimmingly, but there’s really no way to tell what’s going on under all that dirt. Recently, I decided it was time to harvest. To be honest, I think I jumped the gun a bit. I was supposed to stop watering and let the greenery die back slowly, which would give the little spuds time to mature into big spuds. But I was also supposed to harvest before the first rain, or risk squishy spuds rotting in the mud. Well, a few weeks ago we got a ton of rain here. I spooked, I guess, and decided to dismantle the towers before the greenery had died back. Maybe it wasn’t the best decision, but it was the one I felt I had to make. So I began digging. And sifting. And removing. And digging. And two full tires down I was really starting to worry, until . . .
Eureka! I think I actually squealed. All in all it took me over an hour to break down the stacks. In total, I only found one potato higher than the third tire. Almost all of them were clustered in the second tire (the tire the seeds had been planted in), which I didn’t expect. As well, many of them were teeny tiny. So perhaps they’d needed to mature after all. In the end, my haul was pretty puny. Not that I’m complaining, and it actually seems on par with what other bloggers have gotten out of this project. I wonder what we’re all doing wrong? I’m still debating about whether or not I’ll do this again. If I do, I’ll definitely keep my stacks lower – maybe seed in tire #1 and then only stack three high. 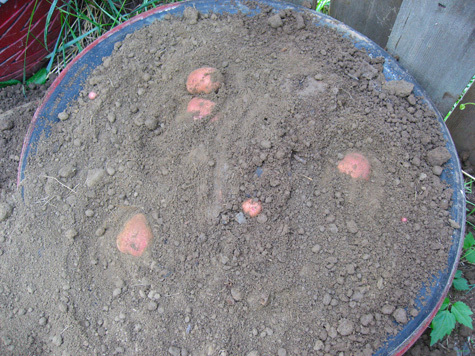 That way, energy can go to growing existing taters, instead of growing more green foliage. The crotchety Russets. They’re so mutant! My pile of Yukon Gold nuggets. This was the largest yield for sure. And finally the Reds, with quite a size range! Am I disappointed with my harvest? Hells No!! I’m so proud of what I grew, and thrilled it worked at all. For a first time spud farmer, I’ve got no complaints. Of course, the fact that they’re maybe the richest, tastiest taters I’ve ever eaten, certainly helps! 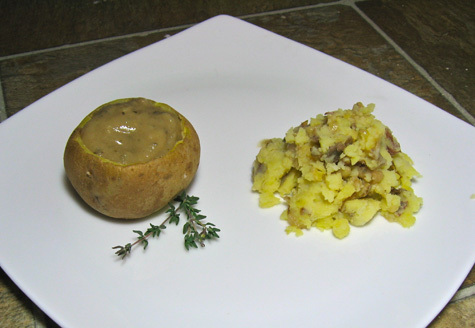 First meal: crushed Yukons with herbed gravy. The Yukons taste like butter. @ Kelly – Thanks, and I totally agree! Anything grown at home is a gift. And yes, it was soooo good, muahaha. Wow. Is there anything you CAN’T do?? Amazing! LOL. I was told to fill the bottom tire with dirt and plant the potatoes and then repeat for each tire you stack up. 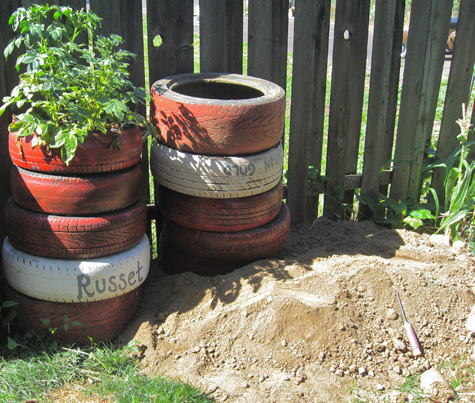 As the season progresses you remove the top tire to harvest and then the next level sprouts. I’m not sure if this way actually works but you can give it a try!! Re: why such small yield and why all at the original level. Several things jump out at me. First the above ground plants looked healthy but small, so I suspect fertility was an issue. Second, judging from the pictures the towers seem to be up against either the north-side of the fence or the east-side of the fence, meaning that they would only get good direct sun at mid-day or in the morning which is problematic. And, though I’ve never tried the tower method or tires, I have understood part of the advantage was the heat gain that tires have because of their matte black surface, so your charming sense of aesthetics may be working against you there. Finally, it seems that a raised system like this would need extra water, the looseness of the soil and great drainage leaving the soil on the dry side. This may be why the stems didn’t put out new roots as they got buried- the upper layers of soil were too dried out. As far as fertility, again from the pictures the soil didn’t appear to have a lot of compost or potting soil, the greenness of the leaves suggest there was enough nitrogen but I have heard that potassium is especially good for potatoes- so maybe some wood ashes or greensand? Concentrates Inc. http://www.concentratesnw.com/ in SE Portland is a good place to buy stuff like that cheap. If nitrogen is a factor chicken manure or urine (yes urine-check this out: http://www.stuff.co.nz/life-style/2883396/Want-a-bumper-tomato-crop-Take-a-leak)would be easy for you, and cottonseed meal would work as a vegan source. 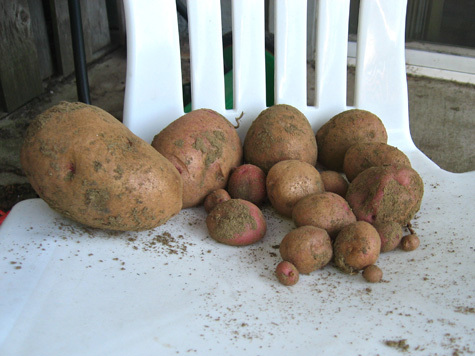 For perfect shaped potatoes sandy soil works best, fresh organic matter can cause scab esp. for russets,and finally, in my experience, rain is not a worry in terms of rot until Nov. at the earliest, those little spuds could have grown to full size if left in through Oct. However, you still yielded quite well for the square footage they occupied and it seems like a pretty easy way to grow and harvest potatoes! @ Heather – Yes, this is the perfect way to maximize small space gardening. Good luck! @ Kimberly – That’s an interesting concept, I’ll have to look into that method. Thanks! @ Dylan – You’re good! Yes yes yes, I think you’re correct with all your analysis. Especially the sandy soil/fertilizer issue. The soil was really hard packed and I didn’t add any compost or anything. I don’t think sunlight was a huge problem, but maybe contributed. And I think water was an issue. Huzzah for your first potato harvest! Those look like some first-rate, super tasty little taters. I second the request for the gravy recipe! Sorry for a silly question, but…are those taters raw?? Hey Sayward, I know this is a year and a half removed almost, but my dad and I were discussing the logistics of US growing potatoes, and he said he had never had luck growing potatoes ANY way because of slugs/bugs on the potatoes/plant. I read all your potato articles but don’t recall you mentioning anything about bugs. I concluded perhaps your chickens “managed” them for you? I’m in NY if that helps? @ Mandie – Hmm, yeah I never had bug issues with my taters, but I don’t think it’s because of the hens. Maybe they don’t like the tire? I had slugs and bugs in the rest of my garden but never in the towers. Interesting, I never thought about that . . .
leaching from the tires, do you think they use 100% foodsafe stuff in tires? do you know if the rubber, lead and other toxins don’t leech in to your potatos? 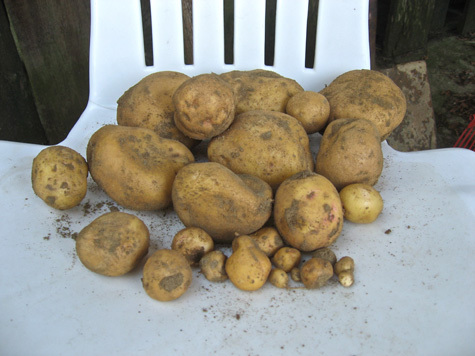 Hi Sayward, when’s the best time of year to plant the potatoes….I’m living in Aussi land….can I plant in winter??? @ Kerry – Potatoes are usually sown in early spring, but I just don’t know enough about the climate over there to really comment. I would say get thee to a local nursery/garden shop and ask them! Luck! Did the tire thing down here in NC and had about 30 plants. Irish Reds. 3 to 4 tires high is a good number and always plant in the first one. I found that if you wait till the leaves die back harvest will be bigger. I saw on T.V. years ago about the tire thing. they called it city gardening. I have a big garden 45 ft by 120 ft but wanted to try something different. My harvest was about 5 plastic store bags full. All in different sizes. The big thing is i had a bunch of plants and some did good and some didn’t. i Think the trick is More plants. Next year im going to try other tatters as well. I also found if you like cucumbers, grow them up instead of out. it saves room and gets the plants off the ground so they dont turn yellow on the ground. I’ve done the tire trick for years. The trick is the dirt! You can’t just use any old dirt. 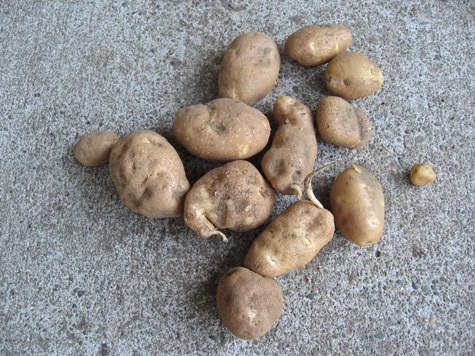 Potatoes prefer soft loamy dirt with light sandyness to it. The dirt is very loose for the potatoes to be able to grow in. The fact that your potatoes look like gold nuggets tells me your dirt is too heavy, packed too hard, and had too much clay in it. I’ve always had potatoes right up into the 4th tire. Who would of thought!! Im excited to give this a shot next year! !